Depending on what you expect out of your listening experience, you will find that you may wish to either couple your speakers or decouple them so you can ensure that they give you the best sound. Today, we are going to take a look at some of the ways you can couple your speakers, but we will also be looking at why you would want to. Coupling speakers may seem like a bit of a complicated subject to understand at first, but you will find that it is not overly complex. While it requires a bit of a working knowledge of the science behind sound, most serious audiophiles will already know most of these principles. If you are relatively new to the discipline, we will try and make things simple enough for easy reading, as even seasoned listeners can sometimes get confused by these matters. Before we get into how to couple or decouple your speakers, we will take a look at what exactly coupling means. If you are a musician or an avid listener, you are probably a little acquainted with the science behind sound, but we will provide a little bit of a refresher as this info can be crucial. When it comes to speaker coupling and spikes, you will need to understand some of the info on how these speakers work in the first place. While most of our readers probably already know the basics, it never hurts to go over them so we can ensure that everyone is on the same page. Coupling is a bit of a complicated subject, so the science of sound will end up playing a rather significant role in the explanation, so keep in mind that this section will be crucial to your understanding. As you know, a sound is made up of waves, similarly, but distinct to electromagnetism and how we can see. While spectrums and wavelengths play a huge role in visible light, you will find that frequency in sound will influence the type of music that we end up hearing. It is for this reason that we have tweeter speakers to play the higher frequencies and subwoofers to play the lower frequencies. Frequencies are less critical in coupling, however. 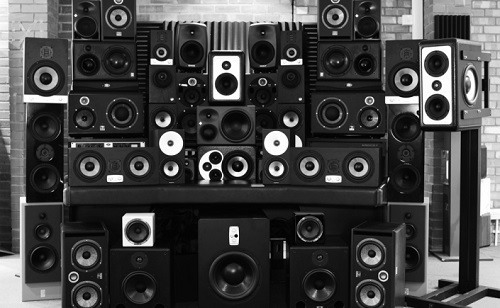 More important is understanding that there is kinetic energy which is involved when a speaker is playing. The driver of your speaker will produce forward kinetic energy when it is playing, and speakers are still subject to Newton’s First Law of Motion, just like everything else on our planet. Newton’s First Law states that all actions have an equal and opposite reaction. In the case of speakers, this means that something will have to move backward to counteract the forward movement of the driver. The part which usually ends up moving back is the cabinet, but due to the relatively heavy construction of most speakers, you will find that the cabinet doesn't move and it instead vibrates. Since sound is made up of vibrations which are controlled precisely, you will find that most uncontrolled vibrations tend to ruin the quality of your sound. It is for this reason that most elements of speaker stand design seek to eliminate these vibrations through either coupling or acoustic decoupling. You will find that some speakers will need to be coupled, and others may need to be decoupled when you are setting them up, but it integral to know the difference before you do so. A speaker which is coupled to the material on which it is resting is a speaker that becomes one with that chosen material. This means that your speaker and the chosen material will share roughly the same acoustic properties and they will both do their part in propagating your sound. If you choose to decouple your speaker from the surface on which it is sitting, you will find that neither of them will affect each other. You may be wondering why you may wish to decouple your speaker if the attached material can become part of the speaker and help add to the sound emission. You will have to keep in mind that audio coupling works both ways, if your speaker is coupled to the floor, it will transmit vibrations to the floor, but the floor will also transfer vibrations to it. Most models of floorstanding speaker stand you come across will feature speaker stand spikes which will help ensure that you can couple and decouple speakers in the way that works best. There are situations in which you want to couple your speakers, situations in which you want to decouple them, and situations in which you want to do both. You will want to couple your speaker so you can diminish the vibrations which are caused by basic physics. These are the vibrations which are caused by Newton’s First Law. If you want your speaker cabinet’s vibration to be reduced, you will find it crucial to couple your speakers to an object with larger mass. The larger mass of the coupled object (such as the floor) will allow you to dissipate the incurred vibrations from your speaker cabinet substantially. It is important to keep in mind, however, that this coupling will not allow you to isolate your speaker from vibrations that are present in your home and floor. It is in these situations which you must decouple. If your floor is made out of a harder substance, like concrete, coupling is usually the best option. If you have a floor which is made out of wood, however, which can easily transmit vibrations, you will very likely prefer to decouple your speakers so they do not have further vibrations transferred to them. As you can see, getting a proper understanding of sound speaker coupling and decoupling is not as difficult as it may seem. It is important to ensure that you do this if you are looking to ensure optimal sound quality in your home, and it can be relatively simple process.